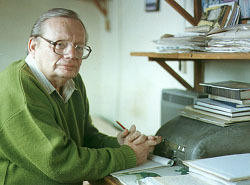 Ruskin Bond was born in Kasauli, Himachal Pradesh, in 1934, and grew up in Jamnagar (Gujrat), Dehradun, and Shimla. In course of a writing career spanning forty years, he has written over a hundred short stories, essays, novels, and more than thirty books of children. Three collections of short stories, The Night Train at Deoli, Time Stops At Shamli, and Our Trees Still Grow In Dehra have been published by Penguin India. he has also edited two anthologies, The Penguin Book Of Indian Ghost Stories, and The Penguin Book Of Indian Railway Stories. The Room On The Roof was his first novel, written when he was seventeen and it recieved the John Llewellyn Rhys Memorial prize in 1957. Vagrants In The Valley was also written in his teens and picked up from where The Room On TheRoof leaves off. These two novellas were published in one volume by Penguin India in 1993 as was a much-acclaimed collection of his non-fiction writing, Rain In The Mountain, Delhi Is Not Far : The Best Of Ruskin Bond was published by Penguin India the following year. As you browse through this site, you'll be reading Ruskin's quotes from his works. There is a page devoted to his poetry. There is yet another page listing his published works....but then you already know all this is there on the site. © Pushkin Passey, 2000. All rights reserved.